Amanda Zhou is a junior at Dartmouth College originally from Brookline, Massachusetts. She’s previously been the associate managing editor, health and wellness beat writer at the Dartmouth and interned at the Pittsburgh Post-Gazette this Fall. She is pursuing a major in quantitative social science and a minor in public policy. At college, she edits the campus newspaper, serves on the campus EMS squad and lives in the sustainable living center. After graduation, she is interested in a career in journalism or data analysis. In her spare time, she can be found running, cooking or trying to rock climb. The College will hire an external investigator to look into hazing allegations concerning 12 student organizations and the Dimensions performance group, senior associate dean of student affairs Liz Agosto ’01 said on Thursday evening. The decision, which was made this week, came after the College received an increased number of reports this term about hazing incidents, including kinds that could threaten the health and safety of students. The organizations include five fraternities, three sororities and co-ed Greek houses, three athletic teams, one student life organization and the Dimensions performance group, which is a student-run organization that performs songs and dances about the College in front of prospective students in the spring. The organizations will be informed whether they are under investigation next week, Agosto said. Barely a week after moving into college, Skylar Miklus ’22 realized they could vote the day of the New Hampshire primary elections. 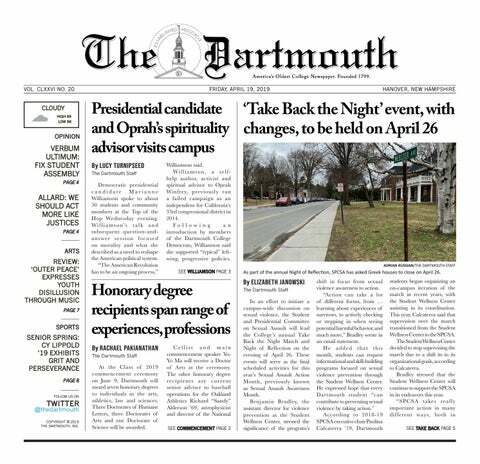 Dartmouth will not build a 750-bed residence hall in College Park due to the high cost of such a project, College President Phil Hanlon announced during yesterday’s termly faculty of arts and sciences meeting. The suspension ends on June 21 and will be followed by alcohol and College probation. An “All Access” meal plan — equivalent to 28 meal swipes a week — will replace the SmartChoice 20 this coming fall. The new plan is transitional and is intended to help move Dartmouth Dining Services away from a meal swipe model toward meal plans with unlimited access to the Class of ’53 Commons by the fall of 2019, DDS director Jon Plodzik said. Dartmouth is in communication and cooperation with Stanford University regarding a Title IX investigation of an incident at Stanford’s Sigma Chi fraternity house on Friday, College spokesperson Diana Lawrence wrote in an email statement. Dartmouth is known for having a high number of options for outdoor activities — one of the benefits of living in rural New Hampshire. This article was featured in the 2017 Freshman Issue. Dear Class of 2021, For a while now, you’ve known you were coming to Dartmouth.